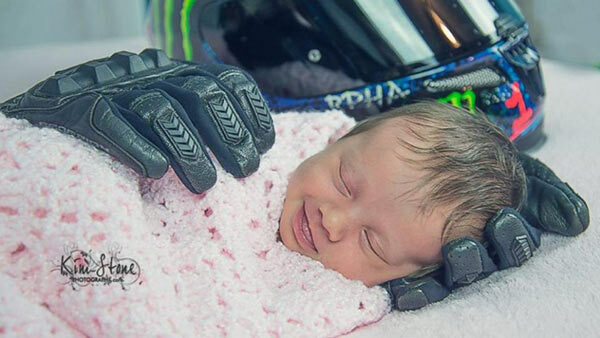 The heartbreaking story behind a newborn baby photographed with motorcycle gear has touched the heart of the internet. Aubrey's grandmother approached her neighbor, Photographer Kim Stone of Marianna, Florida, asking if she could take the newborn's photos. They talked about Hector's passions, one of which was biking. Stone explains, "I wrapped the baby in her swaddle, a blanket her great-grandmother had made. I laid her there and put the helmet next to her. Then as soon as I laid the glove under her head, she began to smile." "I hadn't even set up the lighting or anything else, but I grabbed my camera," she continued. "Kathryn (Williams, Aubrey's mom) was standing behind me, sobbing." The photo has been shared almost 75,000 times and liked more than 350,000 since it was posted on June 10. Stone said, "I do this every day. But here, something special happened."